13 issues for only £37.99! 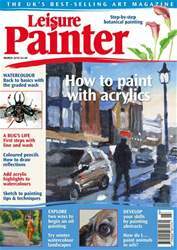 Welcome to the March issue of Leisure Painter. Winter is such a good season to practise and experiment with techniques and media that can be used to good effect when you are painting on the move this summer. Within this month's pages you will find a plethora of practical advice, demonstrations and tutorials to help you develop your skills and confidence in graphite and coloured pencils, watercolour, acrylics, oil, pastels and more. Whether you want to learn drawing skills for line and wash, paint animals in oils or seasonal landscapes in watercolour, there's something here for you. Further your skills as you learn the value of acrylic highlights on less-than-perfect watercolours, how to produce abstracts with collage and colour fields, and paint watercolour flowers with botanical accuracy. Enjoy your month of painting with Leisure Painter.